Below are a few of the Tjukurpa stories, as told by the artists in their longer versions. Kungkarrakalpa or Minyma Tjuta (Seven Sisters) Tjukurpa is a narrative that traverses the landscape across the desert regions belonging to Anangu people, ending in the formation of the constellations of Pleiades and Orion. It is a story told, sung and danced particularly in women's inma (ceremony). 'The sisters are the constellation of Pleiades and the other star Orion is said to be Nyiru or Nyirunya (described as a lusty or bad man). Nyiru is forever chasing the sisters known as the Kunkarunkara women as it is said he wants to marry the eldest sister.The seven sisters travel again and again from the sky to the earth to escape Nyiru’s unwanted attentions. They turn into their human form to escape from the persistent Nyiru, but he always finds them and they flee back to the sky. 'This story tells of two Snake brothers and their wives, who are sisters that lived near Piltati, west of Amata. Every day the women went out hunting, and every evening they bought home kuka (meat for cooking) for the men, who didn’t do anything but perform ceremonies. After a while the sisters became annoyed at the men’s laziness and decided to eat all the food they caught, leaving the men to fend for themselves. The Snake brothers were angry, and decided to punish the women for their insubordination. After lots of talking, the brothers agreed to change themselves into a Wanampi (a giant mythical water serpent, which also had the power to travel above and below ground) and play a practical joke upon the women that would cause them a great deal of hard useless labour. They went to a marsupial rat hole where the women had been digging and imitated the tracks of a large snake by rubbing the back of a spear thrower on the ground. Then they entered the hole, and one of them let out enough of his tail for the women to see. The younger sister became very excited when she saw the tracks of such a large snake and its tail popping out. She begun to pull the snake from its burrow, but the tail kept slipping from her grasp. The Wanampi teased the younger sister by allowing himself to be dragged out a few feet before wriggling himself free. Again and again he let himself be caught before wriggling free once more. Eventually the younger sister became tired, gave up and returned to her sister. In evening, when they were eating dinner, the younger sister told her elder sister how she had almost caught a carpet snake as big as a Wanampi, but couldn’t pull it from its burrow as it was too strong. The big sister said she would help her to catch it the next day. The next morning the women set off with their wana (digging sticks) and piti (large wooden bowl). They dug all day long, then the next day and the next, occasionally glimpsing the snake. Sometimes they caught a small carpet snake enough for their evening meal. The small carpet snakes were created by the Snake men so the women wouldn’t lose heart or grow hungry. They continued to dig after the Wanampi, but they never caught him. In their pursuit the women dug a trench from Aparatjara to Piltati, now a watercourse, approximately 25km long. Their burrow became deeper, and the women dug many subsidiary branches in their pursuit, creating the gorge at Piltati, with its creeks and piles of rock that clutter the valley floor. 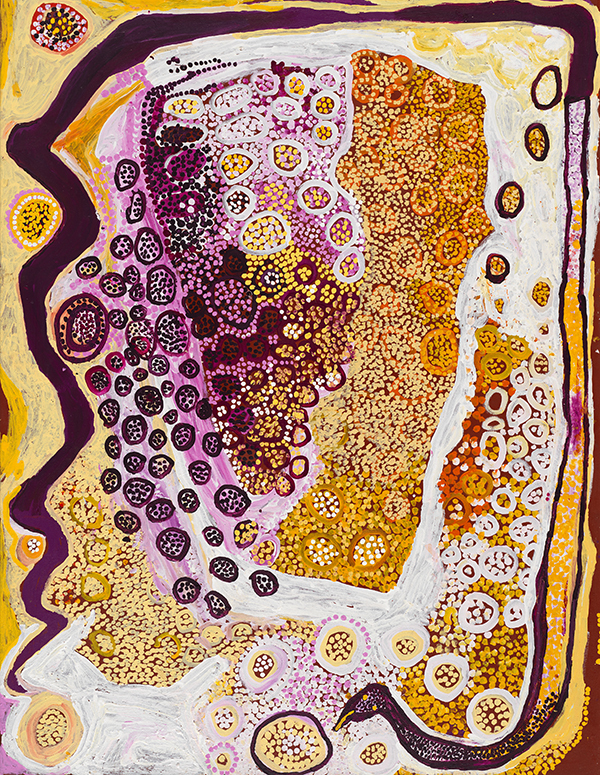 Ngintaka Tjukurpa is the creation story and law of the ancestral Perentie Lizard Man (Wati Ngintaka) and traverses the APY Lands as a songline, or trajectory that follows the tracks of ancestral creation being. A story shared between many Anangu across the Western Desert, it follows the movement of Wati Ngintaka as he listens and searches to find his stolen tjiwa (grinding stone) and return it to his traditional country. 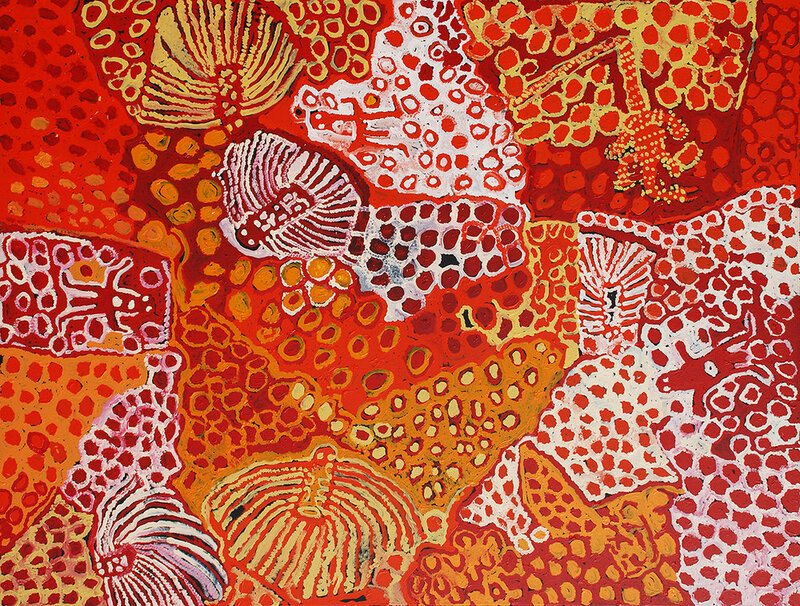 Starting in his camp at Atarangu near Irrunytju (Wingellina), the Ngintaka songline moves far east towards Walyatjara (Wallatinna) (where Wati Ngintaka reclaims the grinding stone), then travelling in short bursts (pursued by his relatives who are confused by the many lizard tracks) in an northern arc back through several important sites ending in Arannga.